The Finger Lakes region of New York State had been suggested to us by some friends as a great spot for a winery tour. 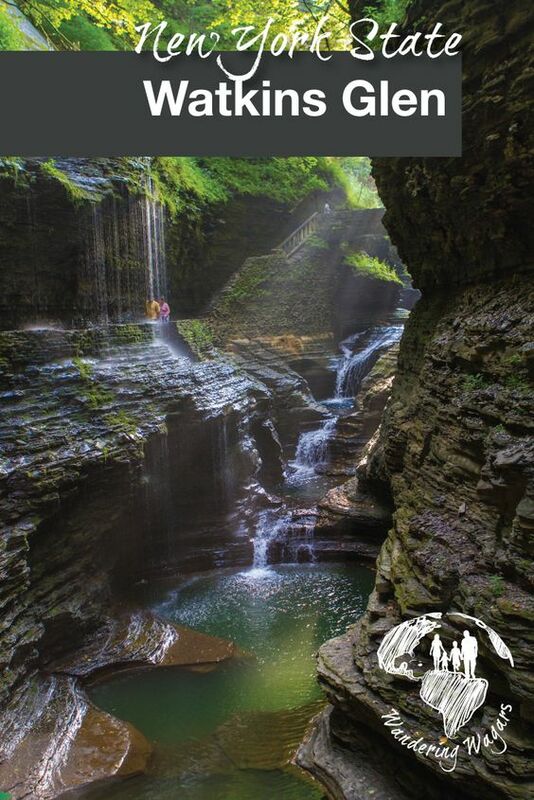 We followed up with some research and Google filled our eyes with stunning photos of Watkins Glen State Park which is a part of the Finger Lakes region. The photos captured our imagination instantly, and we needed to know if real-life was as amazing as the Google images in front of us. This was a place so gorgeous that our intended “date” weekend would have to become our next family destination for the upcoming long weekend. From Toronto, the drive to Watkins Glen, New York is a little over 4 hours. To break up the drive, we planned to stop and spend a chunk of the first day in Rochester where we would take the opportunity to visit the Strong National Museum of Play in Rochester before completing the rest of the drive to Watkins Glen, New York. On our way back from Watkins Glen we also stopped at nearby Corning, New York to visit the wonderful Corning Museum of Glass. Aside from the normal long weekend traffic on the highway, the drive to Rochester was uneventful. After leaving the National Museum of Play, we drove through several towns with pretty, tree-lined streets, past large colonial mansions, many of which, in the college towns, had been converted to bustling fraternity and sorority houses. We didn’t hit any traffic again until we were just outside of Watkins Glen village. Traffic leading into the town was jammed. It turned out that this was the weekend of the annual Watkins Glen Grand Prix. Surrounding us were race fans and antique automobiles as far as the eye could see. It was a crawl to our motel, the Watkins Glen Villager motel, which would normally have only been a 5-minute drive. C and D didn’t mind, though, using the time to admire all the “cool” cars passing by. We arrived and got settled into our motel. Our room was simple, clean, and very large. The motel was right in town and we picked it because of its low cost and walking distance access to Watkins Glen State Park. 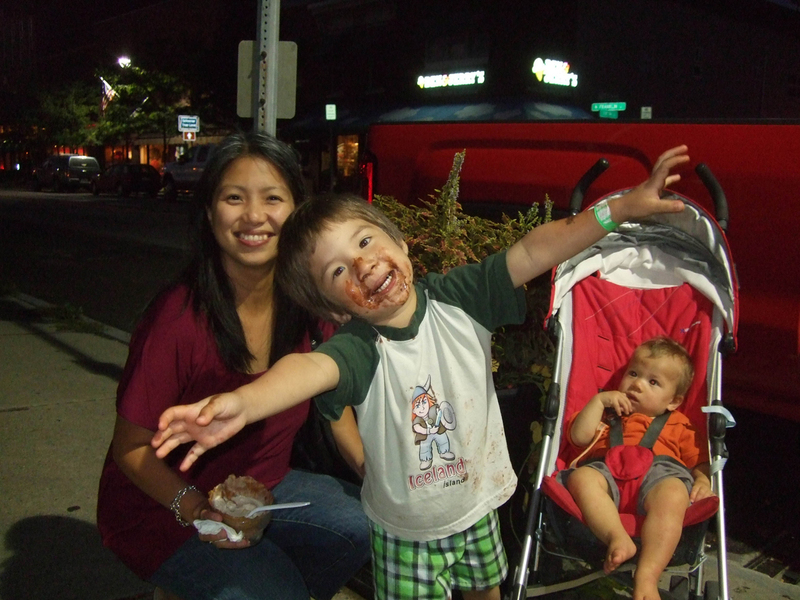 With lots of time to spare before dinner, we indulged in our kids’ favorite activity: eating ice cream. We walked along Franklin St., which is the main north/south thoroughfare in the village. As soon as C saw the “Bear eating an ice cream” wood carving, he knew we had to stop at the Colonial Inn and Motel ice cream shop. We were not disappointed! This Ice Cream shop is something special, not just for its great location near the park, but it has a live beehive visible through plexiglass that fascinated the kids. 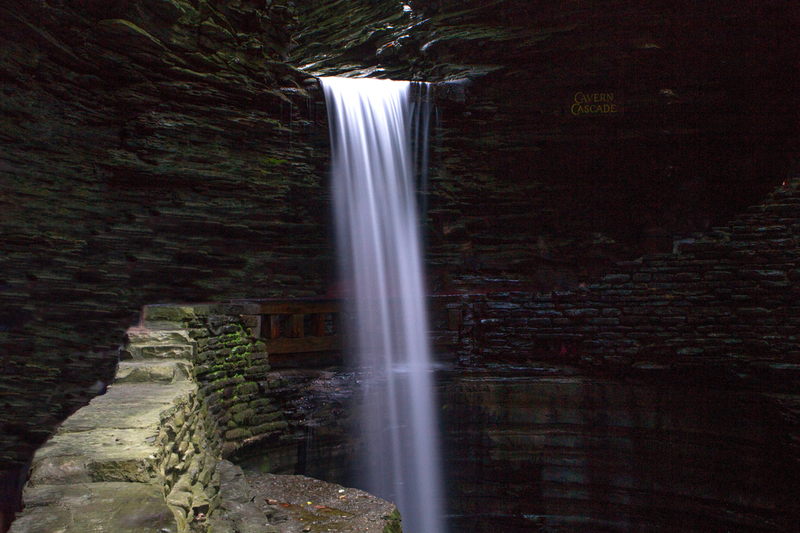 Watkins Glen State Park is fairly small, covering only 3.15 km², but it’s small size packs in over 19 waterfalls. The water comes from the Glen river which helped form the 400-foot deep gorge which is the centerpiece of the park. There are two entrances into the park, the main entrance, and the upper entrance. To explore the park, we had the option of three trails: the Indian trail, the South Rim trail, and the Gorge trail. Both the South Rim and Indian trails run in the wooded areas on either side of upper edges of the gorge. Both trails meet up with the Gorge trail at various points in the park. Be sure to grab a map to keep track of the main sites. The Gorge trail is the only trail that follows the twists and turns of the gorge. It also provides access to the stone bridges and offers the best views of the numerous waterfalls. We decided we would explore the park via the Gorge trail starting at the main entrance first thing in the morning. The Sentry Bridge. After snapping some photos of the picturesque entrance, we walked through the tunnel and were instantly transported into another world. 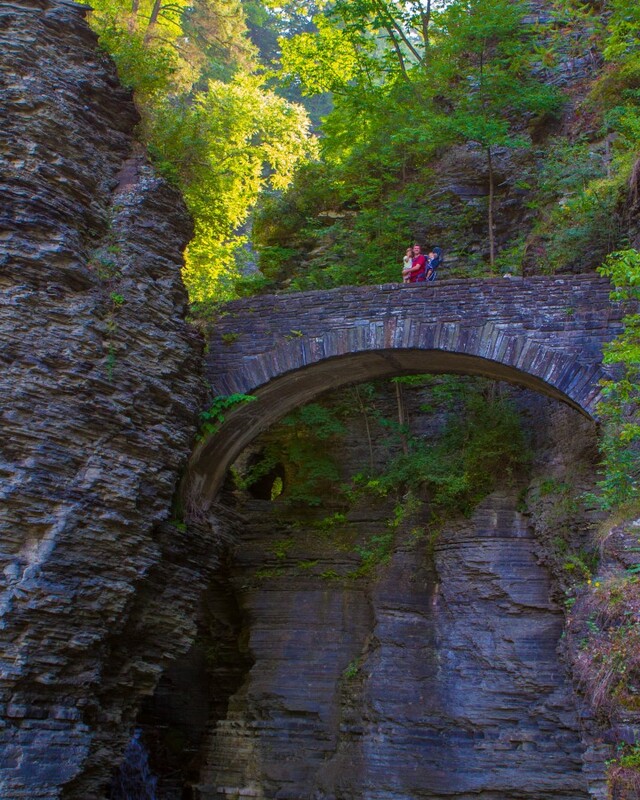 Entering the gorge is an amazing experience where it seems as though the quaint town of Watkins Glen disappears and we were swallowed up by bright green flora, cascading waterfalls and tall cliffs that seemed to reach around us in a tight embrace. The smells of the gorge engulfed us as well, the summer heat giving way to a cool, humid mist that seemed to freshen up everything it touched. Pro-Tip: The parking pass is good for use in all the other state parks in the area if you used on the same day. We admired the view and the gorge pulled us further in towards the first waterfall. The Cavern Cascade is one of two waterfalls that people are able to walk behind. We dipped our hands into the cool, clean cascade and continued on towards the spiral tunnel. C ran ahead into the tunnel and dodged the drips of water coming from the ceiling as he ran up the stone steps towards the exit of the tunnel. As we made our way out of the second tunnel we caught our first glimpse of the only non-stone bridge in the park. The Suspension bridge rises 85 feet from the floor of the gorge and can be accessed via a cliff path you’ll see after emerging from the spiral tunnel. We walked under the bridge enjoying the trail until we got to the Narrows. It is said that the gorge here has its own micro-climate and we noticed ferns and moss growing on the rocks. After climbing some stone steps, we reached Glen Cathedral. Here the climate is distinctly different than the Narrows. With the sun shining brightly it was easy to see that the rocks in this area of the gorge were dry. We paused, Kevin, pointing out to C the rocks and fossils from what was once an ancient seabed! Pro-Tip: This is not the place for heels or flip flops. The stone walkways and steps were slippery at many spots and we were glad we had brought our hikers. Further along, we reached the tallest waterfall in Watkins Glen. Called the Central Cascade, the falls plunge 60 feet into the gorge, giving off a wide mist and wetting the nearby path. We reached the rock bridge which we crossed to get a better view of the clear and inviting pools of water called Glen of Pools. Soon we had reached the second waterfall which we could walk behind, Rainbow Falls. C wasted no time seeing just how wet he could get! The name Rainbow Falls comes from how the afternoon sunlight hits it just right creating many rainbows around the falls. After passing through another gorge and bridge, we reached the end of the Gorge trail. Tired from the long day we decided to walk to the Upper entrance to catch the shuttle back to the main entrance. This meant climbing the 180 steps called Jacob’s ladder which leads to the Upper entrance. When we reached the shuttle pick-up point we realized we had gone into our hike with a serious lack of planning. The shuttle had made its last pick-up just 15 minutes before we got there! Exhausted, but not willing to let this get us down, we made our way towards the Indian trail for the 2.4 km walk back to the main entrance. Pro-Tip: There are no washroom facilities or places to purchase food/drinks inside the park. Make sure to pack enough water and snacks to keep your energy level up. At the time of our visit, there were vendors outside of the park that sold water. The walk back on the Indian trail was uneventful. We had time to reflect on our day and to discuss how The Finger Lakes region, with its quaint wineries and breweries, incredible cottage country and of course, spectacular Watkins Glen, has so much to offer. I was already planning our next trip to the area! We can’t wait to go back. When we finally reached the main entrance, we decided that we certainly deserved a treat and headed for another visit to the Colonial Inn and Motel Ice cream shop for some much-deserved ice cream cones. After our treats, we returned to the motel where we jumped in the pool before getting ready for dinner. Tomorrow we would be driving back to Canada, but first a stop at the Corning Museum of Glass. Your pictures are gorgeous!!! I would love to take my fam there someday! We went one April that had lots of snow and the good trails were closed due to thick ice:( We could glimpse in and see some of the beauty from above but I’d love to go back. It is a beautiful area! Beautiful! I’d love to go someday. WOW. The pictures are phenomenal and definitely inspiring me to plan a trip out there. 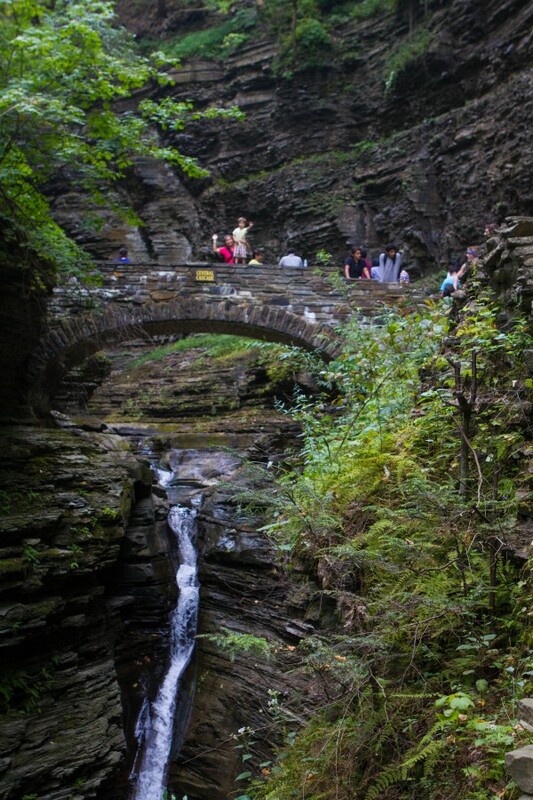 I’m hoping to go check out some Fingerlakes wineries and breweries later this summer, so definitely adding a visit to Watkins Glen to the list! Wow what a gorgeous location that I never knew existed! Have I been living under a rock? I love how you introduce your children to such wonderful places. What a gorgeous looking place, and 19 waterfalls in a relatively small area too! I love the swirling patterns of erosion on the rocks, worn away by the cascades and waterfalls over many many years. I’m a novice hiker, and looking at these photos has gotten me very excited that I could actually follow the Gorge Trail and enjoy it all. And I’m also more than a little intrigued by that ice cream. Looks like it was a great trip full of absolutely gorgeous scenery! What a gorgeous hike! I love that waterfall and pools – looks like the kids had a blast too! The kids definitely had a blast. Specially, the parts when they got to walk under the waterfall. I love all the pictures, especially the falls. It is awesome that you are teaching your kids that exercise is a part of every day life. Also, thanks for the tips about the facilities and packing plenty of water. 19 water falls that is an amazing feat. I bet it was beautiful as well as peaceful and serene. It was definitely beautiful. When the crowds dispersed, it was peaceful as well. If you have a chance to go, check it out. This is such a beautiful place! I’ll have to drag my boyfriend along this summer! Thanks for sharing such a hidden gem. We’ll be in Toronto this summer, and have added this to our itinerary. How incredibly beautiful – a true hidden gem! 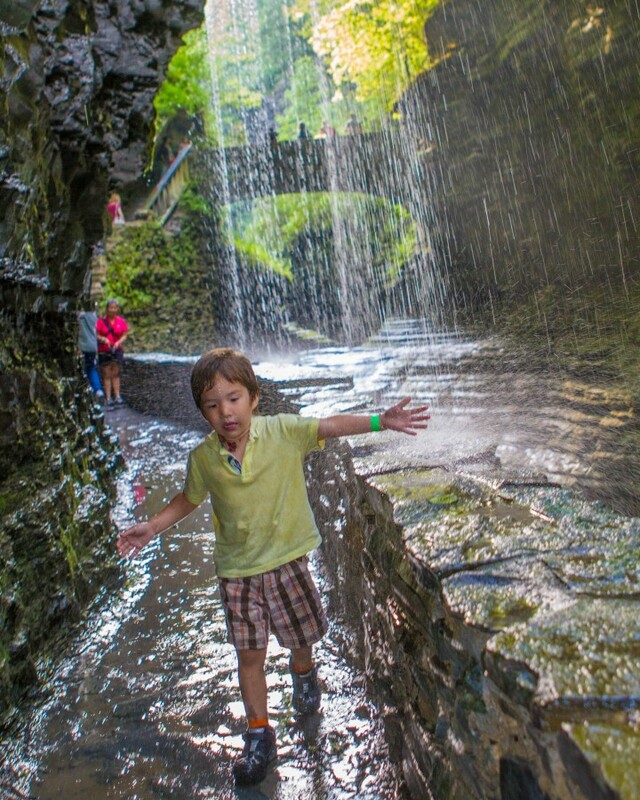 Watkins Glen State Park is about a 4 hours drive from Toronto. When we went there was no line up at the border and no construction. I hope you have the same luck! This place would be perfect on a hot day. What incredible waterfalls. Oh, that is incredible!! Thanks so much for sharing this experience with us!! There is so much to see on this continent and your pictures are simply amazing! It was fun to read this as we are from Rochester. And of course we know Watkins Glen! Gasp! This is EPIC! A 4 hrs drive is very doable and the views are stunning. The chocolate zombie must have had a wonderful time, eh? I really love the trail. Just look at the gorgeous view! I bet it was all worth it. I’m glad the kids had fun despite all the walk! I have walked round mountains and valleys but I have always wanted to do some old fashioned hiking. Great photos! Sounds so fun and good to go. So nice view. Thanks for sharing! My dad was from Trumansburg, so we’ve hiked this a lot. You did a great job capturing it! I didn’t know that there’s a place like this 4hrs from Toronto! I would love to go here. Was it difficult to hike there? Not at all! The hiking is very easy and the paths are not strenuous. The only real climb is the stairway at the upper end of the gorge which could leave you out of breathe. I love reading about your family adventures- your boys are the cutest! The gorge looks beautiful 🙂 How was the hike with D strapped onto your back the whole time? Love reading about you adventures, as always. It’s magical! I love the waterfalls! Wow! What a beautiful place to visit! I love going to parks like this that have so much natural beauty. We always get distracted by wine tasting when we visit the Finger Lakes. Next time, we definitely need to spend some time exploring the natural beauty. We’re clearly missing out here. This looks like such a wonderful hike. I lived in Buffalo for two years while I went to grad school. I didn’t over that way too much as I was swamped with school work and worked at the Falls, but we did make it to Letchworth State Park and really enjoyed it. This place looks absolutely gorgeous! I’m a sucker for waterfalls and will go out of my way to see a pretty one. 🙂 Adding this to the list of places to visit whenever we make it up that way! As soon as I got to the first picture of the Gorge, I was totally convinced I need to go there! A New York road trip may be in order this summer…. I love hiking. This looks like the perfect way to spend a day with the whole family. Lots of fun! This sure looks like a great place to hike, it looks so beautiful and I loved your pictures. Beautiful pictures. I’m a NYC girl and it’s so funny how I bypass the beauty of my own state. Thanks for sharing. I definitely want to visit there. What a unique place! And your pictures are stunning. These pictures look so breathtaking and it’s amazing you can do these family activities! My family never really did things like this. My mom had 4 kids and was always so tired and my dad is not the athletic type. My mom always did her best to take us everywhere we needed to go and for that I’m thankful. If I ever have kids, I want to do outdoor activities like this and teach my kids the importance of nature. Your kids have such great outdoor adventures! The gorge looks stunning, a perfect trail to escape city life with. Love the wooden ice cream bear! Wow. The waterfalls look absolutely gorgeous. You two totally kill it traveling with kids! I hope I’m able to do the same when I have kids. That Gorge Trail looks plain gorgeous! Your kids must love these adventures! Is it possible to swim there, as well? I’m honestly not sure if you can swim there. I got the impression that it wasn’t allowed, but there was no signage indicating either way. I wish I had asked because the pools looked PERFECT for a dip! This place is just stunning! You can’t go wrong with ice-cream. I love the idea that you can see the beehive through the glass. Bees are so important right now. WOW, the pictures amazed me, I did not expect that! Hahah. It looks so peaceful and amazing, and thank you for sharing quick tips too! Definitely need to visit this 🙂 Have a great day! Park and waterfall look like a fairytale, mo wander the kids were so much attracted by that… I would have been too! But… In the end… Did you have some good wine like you friend suggested you? ? Of course we had some of the wine! And some great beer too! Absolutely gorgeous! I’m not the most “outdoors-y” person but I’d like to visit someday, just because it would be a unique trip. I would really, really, have to be a little more fit than I am right now I presume. The hike at Watkins Glen is a very easy one. The paths are stone and apart from some stairs, just about anyone can do it! Man, this is awesome! hiking and trekking with wife and the boys and I know, they are also enjoying the views! Oh my God, my eyes were wide open when I saw that Glen pool photo and the Gorge. I absolutely love nature places like this. Simply amazing! Looks like something out of LOTR book or something. Also, I really like the feature of how many % has finished while reading your blog. So glad you like the shots! It’s such a beautiful place and it really seems to transport you into another world! Awesome to know that this is so close to Toronto! Definitely makes it an easy weekend trip. I absolutely love your photography style! 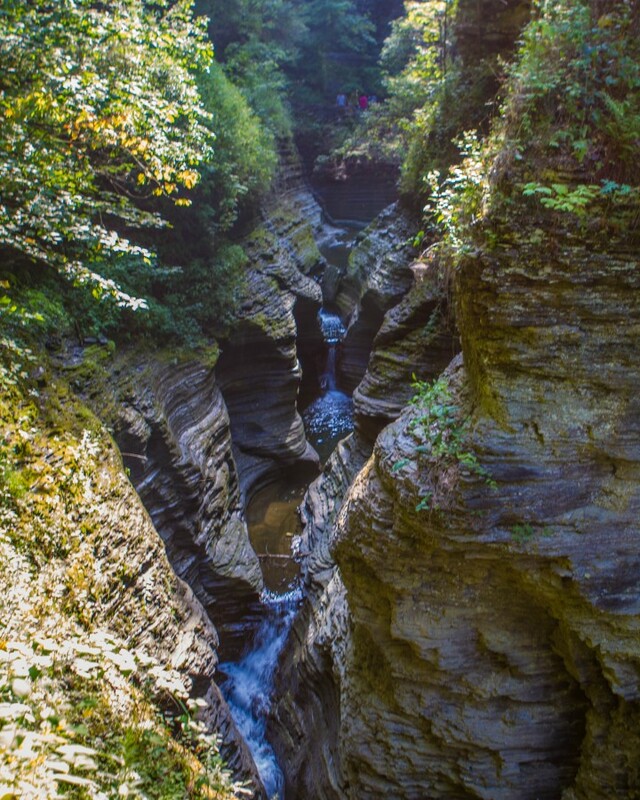 Truthfully, I’d never heard of Watkins Glen State Park before your post but I had a lovely time experiencing it through your photos. The Glen of Pools especially looks amazing. Loved it! Now I really want to go! 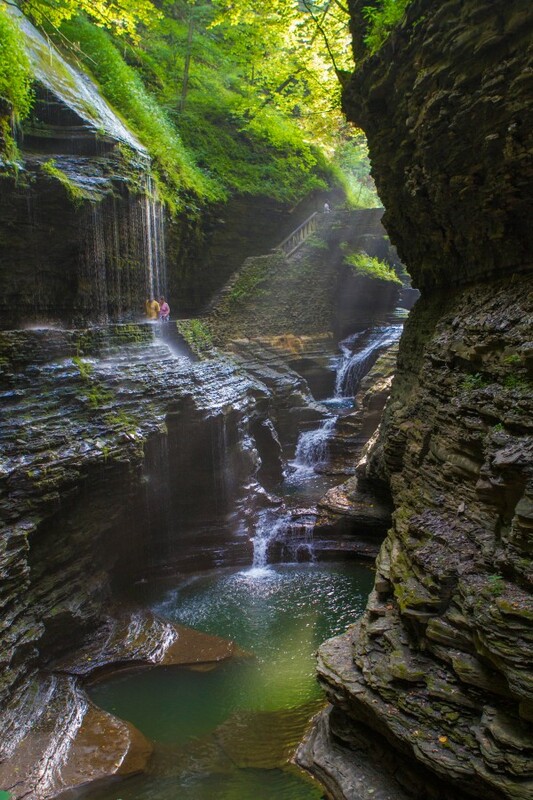 The Watkins Glen State Park looks very stunning. The ice cream shop with a live beehive is a bit intriguing, but I think your kids had a really good time there. Beautiful trail. Those pictures are just so beautiful. I would have loved to even walk down to the stream, if that is possible. Perfect timing! We are headed there this summer. It looks so beautiful! What a wonderful hike, some of those places seem to be straight out of paradise, and your words and pictures bring out the beauty vividly. Loved it. Your pictures are amazing! The park really is so picturesque – I could spend hours photographing the same spot that I would never get any hiking done! Woah seems like you guys had some fun! Those pictures are amazing and really make me wanna head over there! I’ll check it out next time we’re in New York. This place looks so beautiful and the photographs are amazing.I wish to get lost hiking on the George’s trails amidst this stunning landscape. Amazing photos– especially the waterfall shot. It looks like a postcard! I hope to be able to visit here one day. It’s so cool that you do these trips even with small children! That hike through the gorge looks fantastic. And I am really intrigued by a National Museum of Play! There are some amazing museums around the world. Watkins Glen is really beautiful. I’ve read and seen so many things about the Finger Lakes this year that I may need to investigate for myself. 😉 The Gorge Trail is fabulous! I am from New York and haven’t been to the area, but of course heard about it. I think this summer I may have to take a visit. I knew the name Watkins Glen beforehand, because their used to be a Formula 1 race at the track, which I think doesn’t exist anymore. However, I didn’t realise just how beautiful the place actually was! This is definitely somewhere I have to visit! I’ve always wanted to hike the Gorge! It’s on my bucket list! I’ve pinned and bookmarked this post for future use! Thanks! Some great photos especially the cover one! It is good to remember New York State has so much more to offer than New York City itself. Thanks for the inspiration. 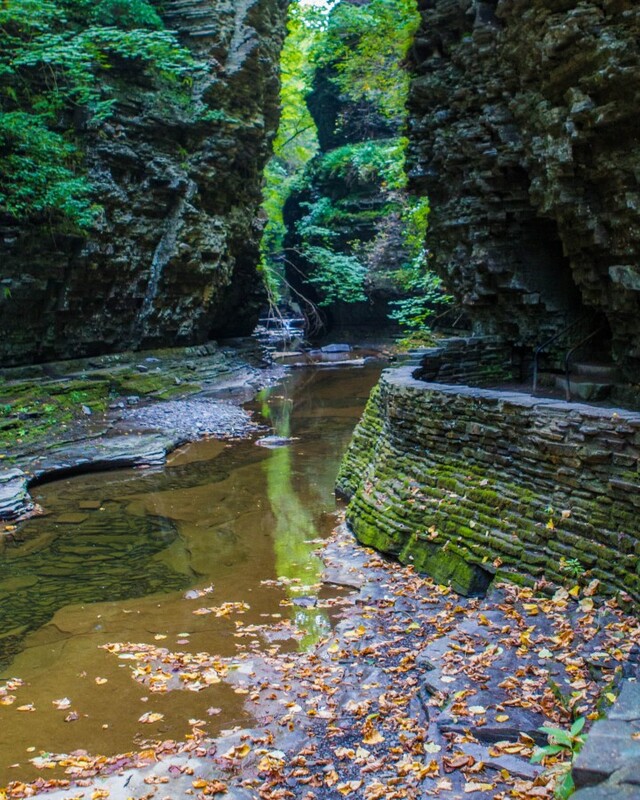 I’ve always loved gorges that I’ve visited so I KNOW I’d love this place! It looks so peaceful and transcendental. Great photos! I would say that blog is really impressive and through the images could guess in a minute that how much you had there. I am also a travel freak and i love to explore such kind of natural places where i could get fun close to nature’s rich charm. We went here last year and I love it! I have heard of another nearby chasm that is supposed to be even more amazing! How much time did it take to go all the way up to the Upper entrance? There are several different trails in the park. Our favorite is the Gorge trail. It can be done quickly in about 45 minutes to walk one-way if you are in good shape. But I recommend spending at least a couple of hours to take in all the views.